Lutz Bacher, an artist who has lived and worked in Berkeley, California since the 1970s, has an artistic practice (un)defined by ambiguity; Bacher has employed different media and constellations of objects and situations to make work about the slippages of meaning of things and experiences that surround us. Materials used include found book pages, paintings, videos, mirrors, mylar, and coal slag, strategies employed are humor and slight irreverence mixed with surveillance of curiosity and topics addressed is, well, hard to delineate. Lutz Bacher, The Celestial Handbook, 2011. Huge Uterus (1989)—a video of the artist undergoing an operation for fibroid tumors—is a deeply personal account of an experience that is as physical and corporeal as anything. Closed Circuit (1997-2000), a forty-minute video animation depicting one of Bacher’s dealers, Pat Hearn, consisted of video stills of the year-long recordings of Hearn in her office. Representing a full year of Hearn’s life, the silent video was a dilution and a distillation of time and images, of a person and a situation. Both Huge Uterus and Closed Circuit take on the deeply personal—so personal that the surveillances are of inside the body and the office space of a by-then deceased individual—and transform this domain into a modus operandi; the images are no longer serving the function of surveillance and have become transgressive, transcendental. The “found”ness or rather the functional, quotidian element in these images are similar to The Celestial Handbook, currently shown at the 13th Istanbul Biennial and yet, this other work of appropriation stands apart in the material’s remove from Bacher the person. The Celestial Handbook, one of my favorites in its simple (early?) eulogy for amateurism, is a work of appropriation. The original work is made up of eighty-five framed book pages, twenty-five of which are displayed at the biennial. The eponymous book is by the famous amateur astronomer Robert Burnham Jr. Published as a three-volume set in 1978. Burnham’s Guide consists of 2,138 pages and lists over 7,000 celestial objects. 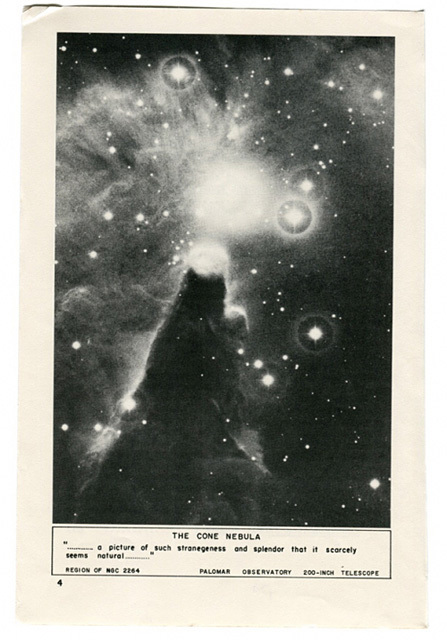 A remarkable feat of dedication, the images in the book could be considered documents of Burnham’s experience as an astronomer, while the captions to the photographs embody the tension between language and the observed. The images, all of which are confrontations with the universe, quite literally, fall short of what we imagine celestial bodies to look like, in their monochrome modesty. Underscoring the partialness of recording observations, Burnham’s inconsistent descriptions, sometimes factual, sometimes exaggeratedly poetic, capture that humbling experience of attempting to vehicle things and experiences. In other words, the captions in the book represent the gap between what Burnham sees and what he can say about what he sees. 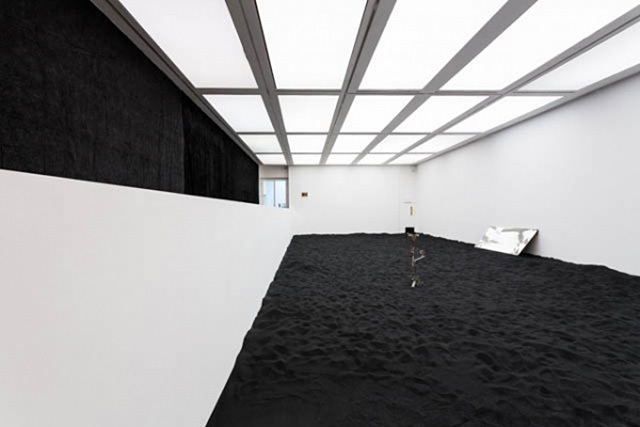 Lutz Bacher, “Black Beauty” installation view at ICA, London. Photo by Mark Blower. Ultimately, Bacher’s gesture of foregrounding, displaying, selecting, exposing this set of images and words that are originally directed towards a niche of hobbyists, is revealing of two impetus: one, the artist’s building of a personalized yet somehow unspecific visual and conceptual vocabulary through dislocating images and words and two, the simple act of sharing a joyous find of amateurism and tenacity. Scattered across the biennial venues, these twenty-five pages that symbolized the joy of discovery and of the idiosyncratic natures of any/all amateurism prevent the viewer from grasping the multiplicity of the pages—both within the selection that the biennial’s curator has made and within the larger selection that Bacher has made from the original book. The experience of the work evolves over the course of viewing the biennial as a whole, spread to four different venues, pointing back to the playful ambiguity that distinguishes the artist’s works; even when we view all the pages, are we even close to grasping Burnham’s world of astronomy? The incompleteness of Bacher’s work is thus merely accentuated and taken a step further with the divided installation at the biennial. Thinking about the process of integration, completion, progression, comprehension through dividing up lead me to Lutz Bacher’s exhibition at ICA, London. Black Beauty is a rigorous introduction to the artist’s oeuvre, in her mixing and re-constructing of visual tropes. Formally reminiscent of Stress Balls (2012)—hundreds of balls scattered across the floor of a room; did the artist walk around squeezing these balls that were then “installed” in the context of a gallery? —Black Beauty (2013) devours the first room upon entry. Tons of black silicate covers the floor. 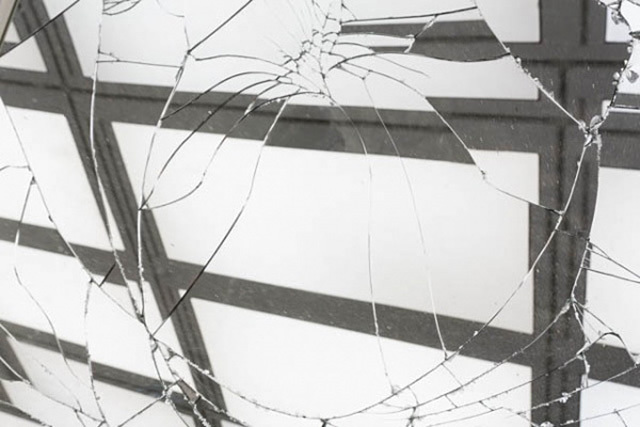 Angels (2013), a broken found mirror, is propped up against the wall at a 45-degree angle, making it even more difficult for the curious viewer to see himself or herself. In the middle of the room is an anthropomorphic, compact David-Smith-gone-bad, made of what seems to be found materials. 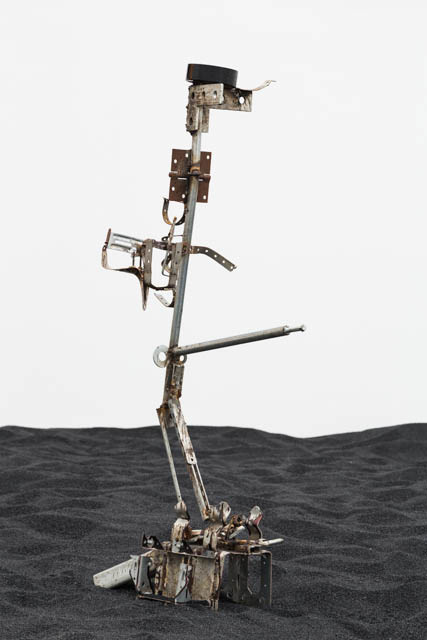 The three elements are charged with a narrative that through the lack of fulfillment, function to see the humor in Bacher’s work; the seemingly meaningless, or rather, absurd set of objects are like desolate props that desire to be used, maybe even exploited if we could get our way. On the second floor is It’s Golden (2013), a corridor of gold mylar that symmetrically divides the space into two galleries. This corridor is a palette cleanser after the forlorn objects of downstairs, leading to setups that are at once most precise and somehow also bare. 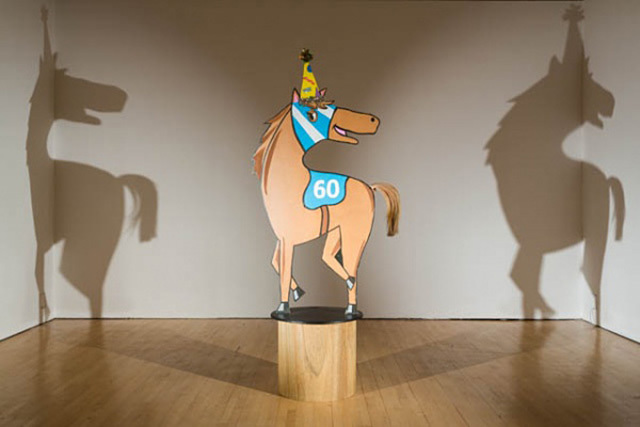 On the left is Horse Shadow (2010-12), a two-dimensional cutout of a horse cartoon, which rotates and casts sharp shadows on the two corners of the room. The eye flickers between the shadows, which are quite beautiful, and the cutout, which is almost too funny to be anything else; this duality created by the very simple setup of the light and the object is further complicated by the third element in the room, Horse Painting (2010). Horse Painting is exactly what the name indicates, taking me back to the tensions between the image and the captions in The Celestial Handbook—the opposite of tension, the complete acquiescence between the image and the caption is deepened by the horse in the middle of the room, that is at once a representation, a trace of a representation, and a physical, kinetic presence. Lutz Bacher, “Angels,” 2013. Photo by Mark Blower. 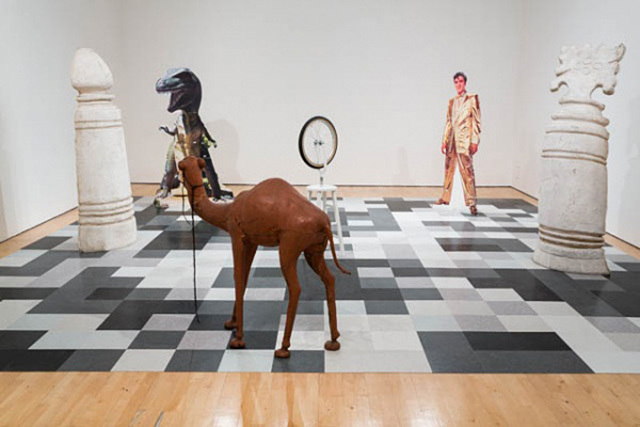 On the right of the golden corridor is Chess (2012), a room-sized chessboard of gradients of gray, black and white, with a peculiar grouping of figures that cutout Elvis, a dinosaur, a camel, Duchamp’s bicycle wheel. The floor, evoking a too-familiar image of pixelation, is an unexpected ground on which this encounter, confrontation or perhaps collective action is staged. The exhibition, with its distinct separation of spaces, reinforced by It’s Golden—a work that transforms the architectural structure through the use of a specific material—serves to bring together quintessentially Bacher elements; while images, representations are poked at in a most Platonic way, pop-icons are juxtaposed with infantile figures and cornerstones of Modern art, bordering on iconoclasm but never really going there. Rooms are submerged in materials and sounds, creating an experience that is fringes on uncomfortable. The constant oscillation between viewership and spectatorship—quite pleasurable—hold up the nebulous entity, or lack thereof, that is Bacher’s work. Lutz Bacher, “Horse Shadow,” 2010-2012. Photo by Mark Blower. Lutz Bacher, “Chess,” 2012. Photo by Mark Blower. Posted in content, on artists and tagged 13th Istanbul Biennial, Angels, Black Beauty, Celestial Handbook, Chess, Closed Circuit, Horse Painting, Horse Shadow, Huge Uterus, ICA, It's Golden, London, Lutz Bacher, Stress Balls. Bookmark the permalink.